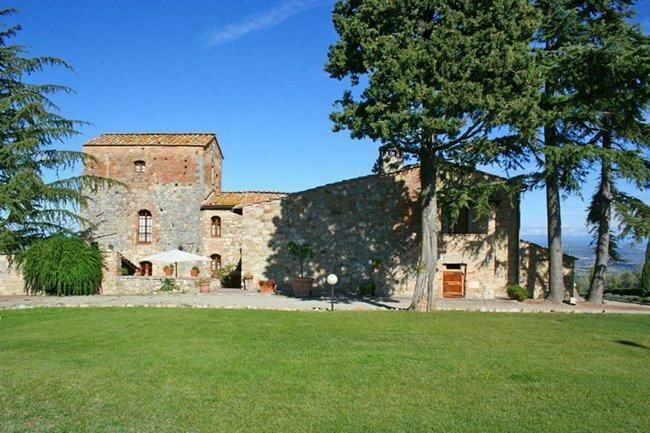 Beautiful stone luxury villa rental in Tuscany, dating back to the XVth century, built around a millenarian sightings tower, situated in quiet and panoramic position on the hills around the medieval town of San Gimignano. This luxury villa rental has been carefully restored preserving its original characteristics and turned into a charming house. The structure is sorrounded by vineyards, olive-trees and more than 400 hectares of land, and it has wonderful views on the sorrounding country-side of Tuscany. The furnishings are very comfortably equipped and furnished in typical Tuscany style. Distances: San Gimignano with all kinds of shops 5 km, Certaldo 15 km, Volterra 25 km, Siena 40 km, Florence appox. 50 km, Pisa (airport) 75 km. At guests’ disposal: private and equipped garden, large swimming pool (16 x 8 m – open from 01/04 to 30/09), tennis court, barbecue. Laundry room and iron available. Parking within the grounds. Access to the luxury villa rental through an unpaved country-side road in good conditions. The weekly price includes maid service an hour per day. Extra services: upon request possibility to hire a baby cot and an extra bed (payment on the spot). 450 m2. Ground floor: well-furnished kitchen (oven, freezer, dishwasher) with access to a well-equipped external court, billiard-room, larg living-room with arched ceilings (TV), dining room, bathroom with shower. 1st floor: small living-room with fireplace, double bedroom, 3 twin-bedded rooms, 2 double bedrooms both with ensuite bathroom with shower, 2 bathrooms each with tub, toilet. In the tower: living-room and reading area.